CIVICS FOR ALL IS MOVING FORWARD! Timing is everything. With broad community support and an enthusiastic and unanimously supportive new school board, the Civics for All Initiative’s prospects have never been brighter. In particular, King County Elections and school board members Rick Burke and Zach DeWolf have taken a very active interest in this widely popular mock election based proposal. Hopes are high that new Seattle Public Schools superintendent, Denise Juneau, will lead the board to formal adoption of the Initiative as one of her early priorities. See the exciting planks of this seven year old proposal in the white panel at right. This equity driven proposal aligns with all three of our district’s Strategic Goals for 2013 to 2018. The basic hoped for timeline: Ballard High School ran a pilot all school mock election in the fall of 2018, all schools will be encouraged to run pilot programs in the fall of 2019, and in 2020 all Seattle K-12 schools will hold mock elections for 54,000 students! Steps to this include getting a district resolution of support, a BAR (board action report), and a formal adoption of the core curriculum model. The district would commit to a five year plan of perfecting the implementation and reviewing the data on turnout, etc. in 2025. The 2018 Ballard High Mock Election was a tremendous success! Students and teachers alike loved the process of studying initiatives and races and voting. In this opt-in election, 1278 paper ballots were turned in (63.9% turnout) and 837 students voted and took an election survey on the overall educational process on the district’s Schoology platform (see all the poll/survey results here). 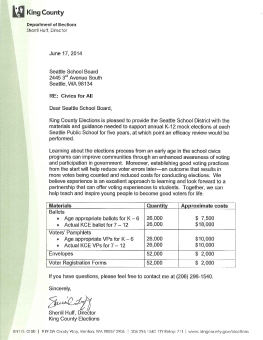 King County Elections (KCE) did the publishing for Ballard’s 2018 mock election, including fancy, “authentic” ballots and Student Voter Pamphlets for each of Ballard’s 2000 students. This is a very exciting partnership between KCE and the district which holds much promise for the future regarding KCE’s original 2014 pledge to support the district’s mock election effort with up to $250,000 over the first five years once the initiative is adopted. 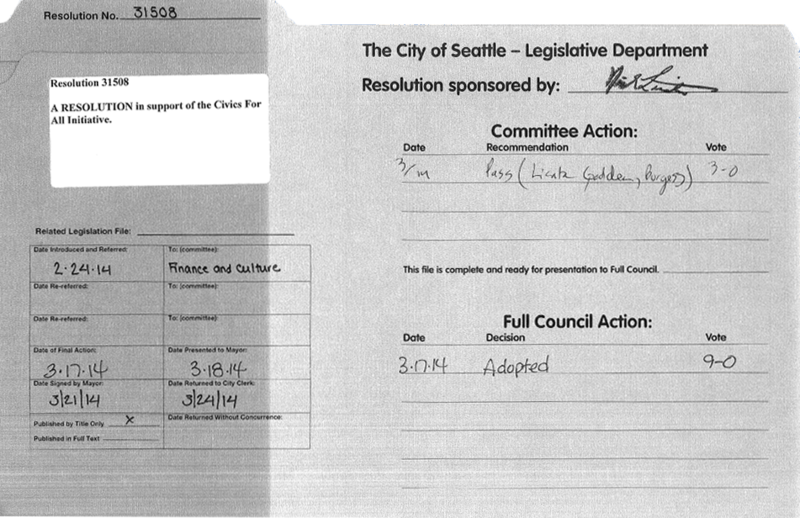 Since Franklin High students first testified on behalf of the initiative in 2011, Seattle’s Civics for All’s Initiative has attracted the hopes of many Seattlites who want our public schools to do a better job of educating our city’s children for citizenship. The core of the proposal, at right, is a K-12 mock election voting requirement designed to prepare all students to become active citizens AND voters upon graduation. It is an equity driven initiative that aims to equip all of city’s children to be civically engaged via active, annual study and voting in mock elections each fall. The list of Civics for All supporters reads like a Who’s Who of civic and education leaders in Seattle, Olympia, and beyond. Despite this vetting, the Seattle School Board rejected the initiative in February of 2016, including the the recommendation by Kathleen Vasquez, the school district’s social studies coordinator, to implement most of the proposal. Vasquez, who is seriously devoted to civics education, helped make some headway on adopting the proposal’s Essential Questions and civics web page. Still, many citizens and supporters have been dismayed by the delay in adoption. But timing is everything and with new SPS leadership the time is ripe for the unanimously supportive school board to work towards a resolution of support and then adoption of the proposal’s requirements. The task now, in 2018, is to convince the new superintendent and school board to adopt and implement this simple, essential, and kid-centered initiative. As background: The former school board decided to not guarantee ALL students the right to participate in mock elections and instead proposed to support optional, annual mock elections, even though mock elections are already optional. Sadly, this decision rejected the Civics for All centerpiece – required universal K-12 mock elections at all schools – as well as the Initiative’s widely vetted civics-based, voter education curriculum and media literacy component. The board’s ostensible commitment to “support optional voting” has seriously failed to provide ALL children equal access to learning about the electoral process in our democracy. In fact, under the district optional plan less than 4000 SPS kids voted via the prescribed Washington Secretary of State’s Youth Votes website in the most controversial election (2016) of our time and just 125 Seattle Public Schools students voted in the 2017 election. If Civics for All had been instituted with K-12 required elections for all, 54,000 students would have voted and engaged in the process with their families and communities. The board’s “optional voter education” decision was and is a huge disappointment for Civics for All supporters across Seattle, where equity is the byword of democracy and education. Indeed, equity is the core value and objective of our district’s Strategic Plan and over 20 other plans, priorities, and policies. Before the February 2016 rejection of the initiative, 6 out of 7 board member had gone on record as supporting Civics for All. Which made sense – Seattle’s school board exudes a passion for kids, education, and justice. Their obvious faith in the unbreakable bonds between education and democracy is reassuring, yet it also makes unclear the delay in formally adopting a strong voter-education program like Civics for All. But change takes time. So, Civics for All supporters remain steadfastly commmited in our idealistic, achievable vision for civics education in the Seattle Public Schools and in our city . At this point we are not clear why the school board rejected the Initiative’s centerpiece – required mock elections at all schools for all students. There is no reason why mock elections cannot be adopted under the district’s curriculum adoption policy. Equally unclear is why the board and district overlooked the incredible support the Initiative has from local teachers, civic leaders, education experts, 7 former school board members, parent leaders, as well as untold hundreds/thousands of Seattlites and their political leaders, including the unanimous support of the Seattle City Council, King County Council, and 21 of 21 Seattle state legislators. Do students have equal rights or not? Too many students under the “optional voting” plan will lose out. Children who happen to be in one of those schools that decide not to take the option will completely miss out for many crucial years. When it comes to learning how to participate in the electoral process, the foundation of our democracy, optional is not equitable, especially if we are sincere about eradicating the civics gap that is crippling our democracy and disenfranchising our youth, especially students of color. CFA proposes that ALL schools, All communities, and ALL students should and would gain by participating annually in district wide mock elections, It takes a formal district policy adoption to institutionalize and guarantee that policies are instituted with fidelity over the long haul as administrators and teachers cycle through our system. When it comes to learning how to participate in the electoral process, the foundation of our democracy, optional is not equitable. It is ironic but true, that by attempting to empower the next generation of new voters with these modest supports, we are actually going to increase the opportunity gap and civics gap between students who receive and those who do not get voter training. Why the School Board, which had openly voiced support for Civics for All Civics all along, opted for such a scaled back approach is, again, unclear. It is true though that all curriculum adoptions take time. Educating young people to grow up to become active voters, especially youth of color and/or low income backgrounds, requires a vertically integrated curriculum that keeps attuned to democratic processes year round. Our school board’s “compromise” of optional elections absolutely fails the standards and spirit of SPS’s strategic goals, especially regarding equity. Civics for ALL aligns directly with each of the District’s goals regarding equity and ending the opportunity gap. See below. Equity and the struggle to end voter disenfranchisement among our students of color and low income populations demands that ALL students receive the same civics education – that was the goal of Civics for All. As of now, that is not happening. Please contact your school board members and let them know you want universal Civics for All, not Civics for Some. Note: the board also authorized an optional day long civics education workshop last spring where approximately 35 teachers created civics lessons plans to be available online via the district and the creation of civics essential questions for K-5 students. This streamlined, non-partisan policy proposal is essentially a voter education program. It calls for increased media literacy and civics instruction in each grade of the social studies, district-wide voting in mock elections each November, and K-12 civics instructional awareness “across the curriculum” when efficacious. Civics for All was “born” on June 15, 2011, when a dozen students of Web Hutchins, the initiative’s founder, presented this student-centered, teacher-friendly proposal to the Seattle Public Schools’ Board of Directors. Since then we have worked to convince the board and, especially, the Seattle School District administration to formally adopt and implement the Civics for All curricular frameworks. School board support has grown tremendously over the years, pioneered by SB President Sharon Peaslee, Marty McClaren, and Sue Peters. Also, many of the other leading candidates in the 2015 fall school board race declared their support for Civics for All, including Lauren McGuire and Michael Christophersen. This is great news because since 2011, district leadership (Superintendents Enfield/Banda/Nyland) has shown uneven interest in adopting the Civics for All proposal, despite the overwhelming support across the city, in all of our legislative bodies (both city and state level delegations), from civics experts around the country, and elsewhere. The school board, ideally with unanimous support including the votes of directors Patu and Blanford, is best situated to convince district staff to adopt the proposal so that all of SPS’s 53,000 students learn the levers of democracy. As Diana Hess, a former UW Husky and now preeminent national civics voice and dean of the U. of Wisconsin College of Education writes: Should Schools Teach Students to Vote? YES! We need your help in convincing them that providing our students a quality civics-based program is the right thing to do! Please Get Involved and help convince all of our school board members, Superintendent Nyland and JSCEE staff to support Civics for All adoption in time for the 2016 election. Civics for All is “Civics in the Core” because civics studies align so smoothly with the coming Common Core State Standards‘ emphasis on distilling argumentative claims from non-fiction texts. Civics for All aligns directly with and will facilitate student success on the “New SAT,” which emphasizes America’s founding documents and current events analysis for the first time in the history of the test. Civics for All, featured in the April 2012 edition of Educational Leadership magazine, proposes that citizenship education is a fundamental student right that is central to our schools’ purpose. To restore this neglected right is a civic imperative that is being proudly embraced across Seattle! Support has been tremendous! Peter Levine, a Tufts University professor who is the nation’s preeminent civics educator , the author of six books on civics and the executive director of CIRCLE, The Center for Information and Research on Civic Learning and Engagement, has written endorsement letters to Superintendent Banda and Mayor Murray. See our complete list of Supporters here.Civics for All emphasis on equity for ALL students dovetails with the civic spirit of so many developments around Seattle, including the Pre-K education initiative as well as Mayor Ed Murray’s recently penned Executive Order reaffirming the City’s commitment to the Race and Social Justice Initiative. Citizens seem most excited by the Initiative’s proposed city-wide mock elections in which 50,000 scholar citizens will annually participate in democracy’s most sacred act: VOTING! Research by CIRCLE “shows emphasizing elections in civics classes has a (long-term) positive impact on political knowledge and voting.” If Superintendent Banda endorses the Initiative, King County Elections and the Secretary of State’s office have both committed to helping facilitate a student-friendly experience, with KCE providing customized, age-appropriate voter’s pamphlets, ballots,and voter registration materials and SOS providing on-line voting and detailed statistical voting analysis. Abundant research proves that when we teach youth the civic values, habits, and skills of citizenship they vote at much higher rates and tend to become voters for life. The Plano Texas School District began doing doing mock elections across their city in 2008. 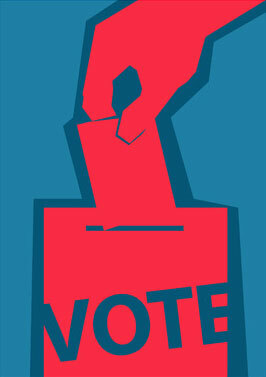 Check out the Plano student voting experience here. 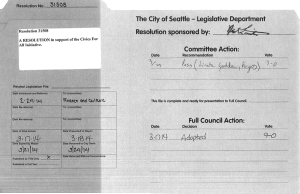 On March 17, 2014, the Seattle City Council and King County Council both unanimously voted to adopt and issue co-Resolutions of Support for the Civics for All Initiative. KCC Chair Larry Phillips and SCC members Bruce Harrell and Nick Licata sponsored the resolutions. Also supporting the proposal: numerous Washington State Legislators, including Eric Pettigrew, Sharon Tomiko-Santos, Reuven Carlyle, Adam Kline, Bob Hasegawa, Jeanne Kohl-Welles, and Eileen Cody; numerous Secretary of State staff, including Sec. Kim Wyman and former Sec. Sam Reed; leading education professors from Seattle U., the UW, UVA, and Stanford; organizations like CityClub; and teachers and citizens from all around the district and city.